Reply Subj: Re: He Was Cool When He Had The Infinity Watch Series. Adam Warlock is back! Reborn from the realm of the dead, Adam has come seeking the Soul Stone…and the truth about what it did to Him! His guide through this Infinity Quest is none other than…Kang the Conqueror?!? Be there as Adam begins down the dark trail sure to lead him into the heart of the mystery of the Infinity Stones. For being the finest artificial intelligence mankind will ever know - it seems pretty buffoonish if Adam believes Kang is on the up and up with this quest to prevent Infinity's End. "You get me the Time Gem and I'll get you the Soul Gem." Adam knows about the Stones but doesn't see that his partner is now Kang The Supergrifter?! Don’t know who Adam Warlock is? 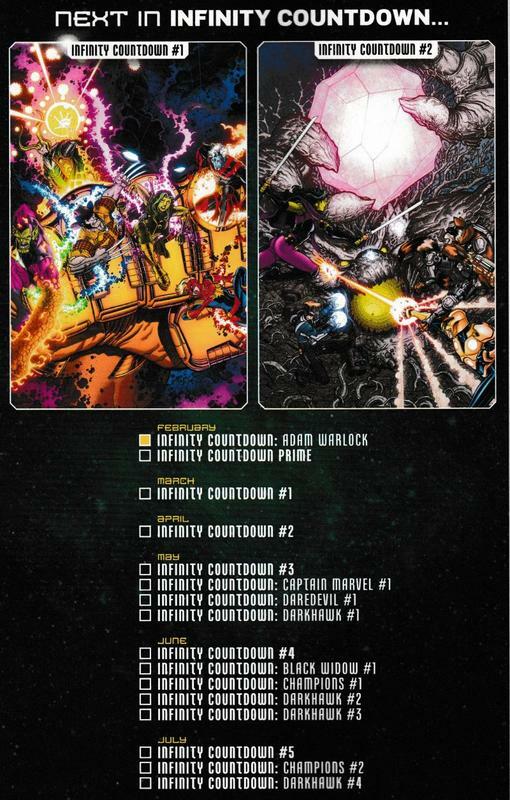 Infinity Countdown: Adam Warlock catches up new readers as to who this classic character is and at the same time sets up the next major event. Writer Gerry Duggan does an excellent job in condensing the 51 year history of the character created by Stan Lee, Jack Kirby, Roy Thomas, Gil Kane, and significant contribution by Jim Starlin. There’s a lot to pack in and Duggan does an excellent job of catching readers up. Incursion of Secret Wars doesn't seem to have affected Adam. And that’s exactly what this issue is, a primer as to who Warlock is and what’s being set up. The issue touches upon the character’s history, the Infinity Stones, and what’s going on. And it feels epic and cosmic, with the cosmic seriously feeling like it’s been lacking in the Marvel Universe. Basically, someone is collecting the Stones and Kang has sent Warlock through time to save the universe. Pretty much all recap. Except the end scene where Adam deals with and is duped by Rama Tut. Who can say if this is before or after the events of FF #19? Especially since any reference to this Forbidden Four is not even mentioned for the whole story. Sad. What’s interesting to me though is this issue’s reflection on the current season of Agents of S.H.I.E.L.D. in what is revealed and what we know is coming in the Marvel Cinematic Universe. Hopefully the two will be a bit more divergent that what is revealed here. The next ep will be very interesting to see what they will do now that they're back in the Present. And also, who didn't make it back. But, what definitely stands out as original is Mike Allred‘s art. I love Allred’s style which takes so much from Kirby (in a good way). The pop style art is suited so well to cosmic stories in space with grand imagery and trippy visuals. Allred clearly has fun with impressive double page spreads taking us through history in a journey that’s fun to look at. That’s helped by colorist Laura Allred who delivers a color palette that feels like it’s missing black light. The colors are bright and full of energy that matches Mike’s style. Cory Petit‘s lettering helps too, emphasizing the emotional moments throughout. It adds to the pop sensibility of the visuals within. The double page spreads were grand and trippy. The Celestium splash page was cool, too. Another thing to note is all the dead heroes at Infinity's End because this company wide Event means all those seen will survive (and come back if gone) in time for this crisis. While the story for the issue doesn’t excite, it does an excellent job of setting things up and taking us through Warlock’s history. The art though is what stands out and is utterly amazing. There’s something so unique about it all and out of everything this is the draw, no pun intended. A visual treat that is a solid way to catch up and see where things are going. While this artstyle is not my favourite, it really does stand out with the colours and layouts. It seems there was a lot more attention to detail than the Silver Surfer run had with squiggly and morphic aliens. The novel little hourglass countdown in the corners was novel and pertinent. And yeah, the story did not excite but, at least, it brings back Adam Warlock with exposition and the Event set up was straight forward. Clearly, readers will have to brace for another exciting game of Temporal Mechanics and Chronological Crap. We also have to endure this dumb numbering and different bookend titling.